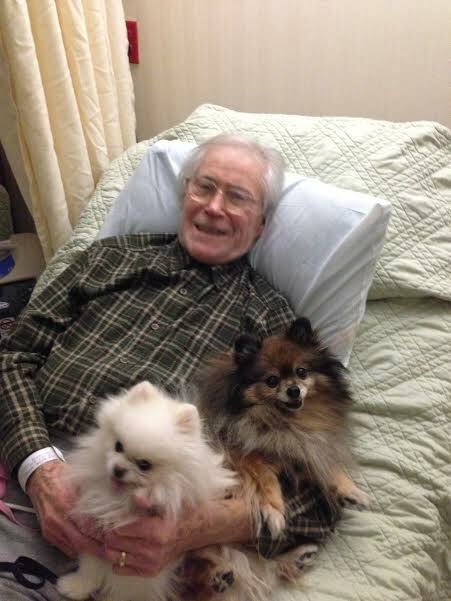 My 84-year-old father died in March at a rehabilitation facility on the East Coast. He was a veteran, a family man, and an active member of his community. I believe he was a victim of “stealth euthanasia”–against his will–and that he died at the hands of a rogue nurse with very misguided philosophies. At the end of January, my father had developed a nosebleed, went into the hospital for evaluation, and was then transferred to a rehabilitation facility. You may wonder, “Why was he sent there?” I cannot answer that question. The reason is a mystery to me. At the rehab facility, Dad slipped on a sock that was halfway off his foot and suffered a hairline fracture of his greater trochanter (the upper end of the femur), which the orthopedist said would heal on its own without surgery. Although he had been diagnosed a while back with chronic myeloid leukemia (which is not a terminal condition), the medical records from the hospital’s oncologist confirm that my dad’s condition was stable. There was no major medical event that would account for his dying other than the Roxanol (a highly concentrated form of morphine) that he was given. The nurse practitioner at the rehab center never called to consult with my father’s primary care doctor, who would have told her that Dad was not terminally ill. Nor did she consult with the hospital’s oncologist. I am convinced of one thing: the nurse practitioner orchestrated my dad’s untimely death. About four weeks after my father fell, the nurse practitioner and other staff members at the rehab center led me to believe that my father was having difficulty breathing. I was there with my father and could not detect any issues with his breathing. Nevertheless, he was diagnosed with pneumonia and put on antibiotics. Later they said it wasn’t pneumonia, claiming instead that his chronic leukemia was getting worse, which I now know was not true. My family was also told that Dad was dying, when he was not! The nurse practitioner pressured me very aggressively to approve hospice care for Dad. She also asked me to approve the use of Ativan (a medication used to treat anxiety) and morphine even though he did not seem to be in pain. I have learned, from conversations with friends who are physicians, that morphine can suppress a person’s breathing and can cause death. But I was not informed about this at the time, so I agreed to the use of hospice and these drugs. At one point I was told by his nurse practitioner that hospice had been cancelled (even though the records don’t show that hospice was involved at that time) and that they were just going to “do it” with medication. It was truly horrifying! I felt that I was in the Twilight Zone. I regret deeply that I did not go straight to the authorities! However, I did contact an attorney who advised me to write to the facility’s administrator and ask her for answers to my many questions, chief of which was “Why are my father’s wishes not being respected?” I did so and also informed her that I had a videotape of my father saying that he wanted to live. My letter was ignored. Dad wanted to be home and under the care of his regular physician. He wanted to live and his wishes were ignored, even when I supported and spoke up for his wishes. Also, his best friend of the past 30 years stated that my father had told him that he wanted to live, a statement that this friend later had notarized and gave to me. On the evening before Dad’s death, my mother was called and told to come to the rehab center because my dad would pass “in about five hours.” How could the staff know that he would die in five hours when death does not arrive on time like someone arriving for an appointment? The fact that the staff knew exactly when my father was going to die is very suspicious, and I believe it had much to do with the drugs they were giving him. Prior to being given morphine, Dad did not have the well-recognized signs of the active phase of dying. However, after he began receiving Roxanol, his condition rapidly declined. In 2013, Ethics & Medics published an article by four experts who asserted, “When opioids are used to impose death, health care professionals usually cloak their actions by telling families that the signs of approaching death being observed are due to a terminal illness, not to the adverse effects of a clinical overdose, which conveniently mirror some of the signs of the end-stage active phase of dying.”  I believe that my father’s death was not natural or accidental. I emailed the administrator again on March 2, the morning of my dad’s death. She responded that she had no legal authority to answer me. So I know she received my email. I indicated that I believed a crime had been committed and reminded her that euthanasia is not legal in Massachusetts. Two days later this administrator released his body for cremation, making it impossible to run toxicology tests. On March 3, I received a call from a Veterans Administration agent who had visited my dad regarding his service-related disability claim about five days before his death. The man was shocked to hear that my dad had passed away and that the day after their visit, Dad had been declared incapable of making his own medical decisions. The man said he had spent several hours with my dad, who was perfectly lucid and answered all of his questions. The nurse practitioner had told me she had a conversation with my dad on the same day the VA agent interviewed him. She also said he was lucid. A day later, she had my father declared incapable of making of his own decisions and invoked the health care proxy. My father did not go from being perfectly lucid to being mentally incapacitated overnight. In fact, he was still perfectly lucid. Invoking the health care proxy made my sister the one responsible for Dad’s health care decisions. Legally, my mother should have been named his proxy decision-maker, but she was bypassed because the nurse practitioner did not think she was capable. My sister, who is also a nurse practitioner, was shocked. She said, “Now Dad loses all his rights.” It is my understanding that having a person declared incapable of making their own decisions is not just a matter of having someone sign a form, but that is what was done. The whole thing was an outrage! My sister decided to involve hospice in Dad’s care and agreed to its treatment regimen. Hospice took over my father’s care at 1:00 PM on March 1. Dad was dead at 3:30 AM on March 2. I had called the hospice the day before my dad’s death, requesting to be included in its support and bereavement services. I mentioned that I did not agree with what was going on. The case manager hung up on me! This treatment totally contradicted the “warm and fuzzy” impression of hospice that I had been led to believe in. This was a terribly cruel way to treat me when my father was dying. I have since then learned that they considered me to be trouble when I said I did not agree with what was going on. I have filed a complaint with the Massachusetts Board of Nursing and will be filing one against this hospice too. When I called the regulatory department and told them how the hospice had treated me, the woman I spoke with was gasping with shock. She said I should definitely file a complaint. I have done a lot of research and have come to understand that “stealth euthanasia” is a widespread problem and a deeply troubling trend. For example, an indictment was recently handed down for sixteen people who were overdosing patients at a hospice in Texas. In some cases the overdoses led to death. The reasons for “stealth euthanasia” range from intervention by rogue health care personnel, as in the case of my father, to concerns about the cost of care or the allocation of health care resources, to simple greed. In just one month, three of my friends told me that they have had similar horrifying experiences. Even people I don’t know have reached out to me on Facebook to tell me about their loved ones who they believe were killed by health care providers. Just like me, they are traumatized and extremely distressed. It is crucially important to make the public aware of “stealth euthanasia.” Whether someone has two weeks, six months, or two years to live, no one has the right to take that time away from them and their family members by imposing death! The rehab facility and hospice staff not only ended my father’s life prematurely and against his will, they left me deeply troubled by this horrendous ordeal. Losing a loved one is hard enough, but under these conditions it is unbearable! Heidi Wise’s story of her father’s death was originally published by Hospice Patients Alliance (see http://www.hospicepatients.org/heidi-wise-reports-she-witnessed-involuntary-stealth-euthanasia-in-hospice.html). The author updated and adapted her story for the PHA Monthly and it is reprinted here with the author’s permission. Editor’s note: There are a number of resources available to assist people who are attempting to protect loved ones whose rights and lives are endangered in health care settings. Contact the Pro-life Healthcare Alliance for more information: 651-484-1040. Ralph A. Capone, MD, FACP; Kenneth R. Stevens Jr., MD, FACR; Julie Grimstad; and Ron Panzer, LPN, “The Rise of Stealth Euthanasia,” Ethics & Medics, Vol. 38, No. 6, June 2013.